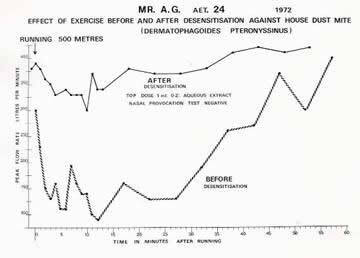 Personal experience with Desensitisation - a Historical Note? Two thousand years ago King Mithridates was so afraid of being poisoned that he took increasing doses of all the poisons available until he became immune to lethal doses. In other words, as long as the increase in the dose did not exceed his ability to adapt to the poison he would suffer no effects, immunity would finally be achieved, and immunity could be maintained by taking daily doses of poison. Perhaps he invented the concept of desensitisation, which is still used today when drugs such as aspirin or penicillin cause serious reactions. In 1902 Charles Richet observed that animals injected with a second dose of an foreign protein died suddenly, even though the first injection had caused no reaction, and he invented the word ‘anaphylaxis’ to describe this phenomenon. Then in 1906 Clemens Von Pirquet reported severe reactions in patients to a second injection of anti-diphtheria antitoxin which had been raised in horses, and invented the word ‘allergy’ to describe these reactions. In 1908 in London a Dr Schofield treated a teenager who had dangerous reactions to egg by giving him pills which, unknown to the patient, contained gradually increasing amounts of egg, The result was that within six months he was able to eat eggs every day with no effect. Charles Harrison Blackley (1820-1900) was a medical doctor in Manchester who suffered from seasonal hay fever, a complaint so rare at that time that he could not find anyone else to experiment on! He caught pollen from the air, carried out a daily pollen count for the first time, and even sent up a pollen trap on a kite to show that pollen is carried high in the air by the wind. He also invented the skin test, and finally proved beyond doubt that pollen was the cause of his hay fever, by sniffing some pollen up his own nose in the winter thus producing an attack of hay fever out of season. He published a book describing his researches on Hay Fever in 1873, but his pioneer work attracted no interest until 1911, when Noon and Freeman successfully desensitised sufferers with injections of pollen extract. More details of Freeman’s methods are given later as a matter of interest, and because we might learn something from them today. Desensitisation techniques were further developed by many researchers in the USA and in Europe. In the USA ragweed pollen is such a potent allergen that drugs alone are often insufficient to control symptoms, so ‘allergy shots’ became, and still is, a popular method of treatment In the USA. Methods of purifying allergens and the invention of slow release vaccines made reactions less likely and required fewer injections. Depots of vaccines emulsified in oil were developed which required only one or two injections a year, but were withdrawn because of occasional abscess formation. In the nineteen sixties I made an emulsifying machine and gave a great many allergen emulsion injections with excellent results using a wide range of allergens. Slow release vaccines are even now constantly undergoing modification in the laboratories of the manufacturers, targeted at desensitising the patient without any risk of the injections causing a reaction. 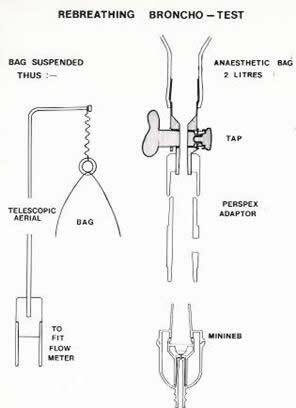 In 1986 the British Committee for Safety of Medicines, alarmed because some deaths had followed allergen injections, decreed that these injections could only be administered when full equipment to cope with any emergency was at hand, and further that the patient must remain under supervision in the clinic for two hours after the injection. This had the effect of stopping this treatment completely, mainly because of the long waiting period, since modified to one hour. This over-reaction has deprived British patients of many facilities for investigation of allergies leading to specific diagnosis and treatment. It also dealt a serious blow to any development of the specialty of clinical allergy with consequences which are still with us today, nearly twenty years later. For example, it is specifically forbidden to treat asthma, which can be fatal, by desensitisation, but it is permissible to treat hay fever, which is never fatal. It is obvious that to give injections through the skin is not a natural intervention, and that the introduction of foreign material through a needle into the tissues can never be absolutely free from the possibility of some sort of reaction against it. The sublingual route (under the tongue) is not invasive, has been found in many clinical trials in Europe to be free from risk, and can be given to children with good results for allergy to mites as well as pollens. Trials of Sub Lingual Immuno Therapy ( SLIT) for Hay Fever have been carried out recently in the UK, with excellent results. It has been prescribable on the NHS for several years, but usually refused on account of cost. Injecting hay fever patients with gradually increasing doses of pollen extract was first used at St Mary’s Hospital by Leonard Noon and John Freeman in 1911. 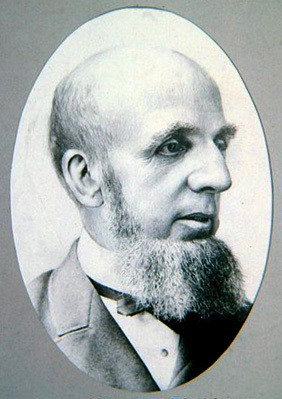 After Noon died a tremendous amount of research was carried out by Freeman, who established a special hay fever clinic where the patients were instructed in how to give themselves the pollen injections. Presumably this was necessary because general practitioners were reluctant to give these injections, and certainly because he wanted to make sure that they were done properly and safely. No less than thirty pages are devoted to the intimate details of self injection, complete with diagrams, in his book on Hay Fever. Classes were held at the clinic to ensure that the patients were fully trained and capable of injecting themselves with the correct dose of pollen extract from the correct bottle out of the ten supplied which were of increasing strength. They were taught exactly how to do this, and even how to cope with a reaction, if it should occur, by giving themselves an adrenaline injection which was also supplied in the kit. Even children could be trained to carry out this procedure without trouble. The instruction had to be meticulous to ensure that they gave themselves the correct dose every day for fifty-four days and a dosage card is shown below as a matter of interest. No case of anaphylaxis or death was ever reported from this regime, which many thousands of patients carried out successfully. In my opinion the reason for the absence of serious problems was that the doses increased each time by small amount (6%), and the injections were given every day, thus providing a constant stimulus to the immune system. The results were excellent, probably because the top dose reached was far higher than any ever reached since, and the target which had to be achieved was a negative skin test to grass pollen. It is astonishing the lengths people would go to avoid hay fever each summer, but there were no effective drugs until about 1950, and intensely sensitive cases had to stay inside, or even emigrate, during the season This regimen was used from the nineteen thirties until about 1966, but today would never be permitted. Freeman also invented a system of “rush Inoculation” for patients who came along just before the season, the injections being given in hospital every two or three hours, starting at 5 am and finishing at 11pm, thus completing the course in a week. The very thought of such a procedure would give the Committee for Safety a fit, but it was really effective. 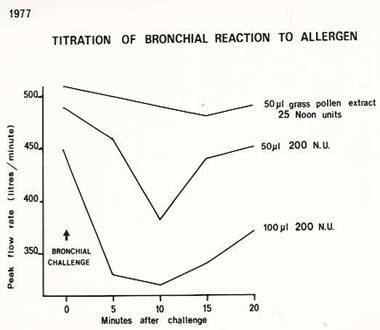 Tracings of skin test reactions to grass pollen decreasing as the dose injected increased, in response to the daily injections. The skin test finally became nearly negative after seven extra top doses!! After this lot courting in a hayfield without a sneeze should have been possible ! Part of the report on his activities for the year by John Freeman to the Annual General Meeting of the Asthma Research Council in 1938 is worth quoting, as it seems to illustrate the character of this great pioneer. In 1986 the British Committee for Safety of Medicines, alarmed because some deaths had followed allergen injections, decreed that these injections could only be administered when full equipment to cope with any emergency was at hand, and further that the patient must remain under supervision in the clinic for two hours after the injection. This had the effect of stopping this treatment completely, mainly because of the long waiting period, since modified to one hour. This over-reaction has deprived British patients of many facilities for investigation of allergies leading to specific diagnosis and treatment. It also dealt a serious blow to development of the specialty of clinical allergy with consequences which are still with us today, nearly twenty years later. Today it is specifically forbidden to treat asthma, which can be fatal, by desensitisation, but it is permissible to treat hay fever, which is never fatal. This is illogical because chronic asthma due to an allergen which cannot be avoided, such as mites, can be very effectively and safely treated in this way. or a demonstration of the possible? Before desensitisation became impossible my standard treatment plan was to identify the causative allergen, and confirm that this was the correct allergen by carrying out a nasal or bronchial provocation test. The provocation test was to prove that desensitising injections were really necessary, and were a justifiable treatment. Furthermore, another provocation test at the end of the course of injections would prove if the patient had been successfully desensitised or not. If still positive further injections would be given, followed by another provocation test. This approach, which was made possible by my personal development of bronchial and nasal provocation tests which could be carried out on out-patients, put desensitisation therapy on an objective basis with clear proof of effectiveness. For hay fever patients the ‘microspoon’ provocation test enabled a measured dose of dry grass pollen to be flicked up the nose to prove sensitivity, and again at the end of the usual treatment course to prove immunity, or the need for more injections until a negative response was achieved. The microspoon is 1mm wide, 0.5 mm deep and holds 100 (+/- 10) micrograms of grass pollen, (about 10 grains) which is approximately the amount inhaled in a day at the peak of the season. If pollen injections were given until the nasal test was negative the results were excellent. This new approach to make sure that the injections had been worth while was published, but attracted no interest whatever. This was one of the first patients I desensitised, and also monitored the result with a peak flow meter before and after treatment The decrease in daily swing in the peak flow is a common result of this type of treatment. 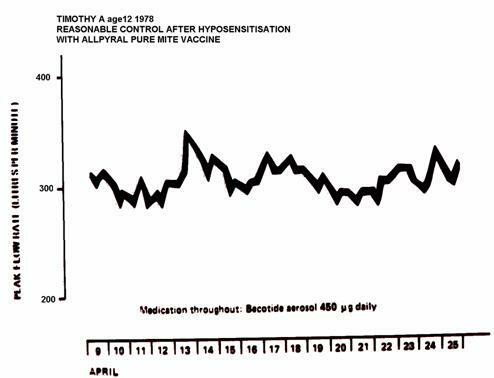 Before 1986 there were two forms of desensitisation available, the delayed release vaccine given weekly,. and aqueous or watery extracts which were available for a wide range of allergens, particularly dust mite. Injections of aqueous extracts deliver the allergen directly into the circulation, so they must be treated with respect and are best given in hospital. A revised dosage schedule was used, the steps in dosage were small, and injections were given three times a day over a period of ten days. 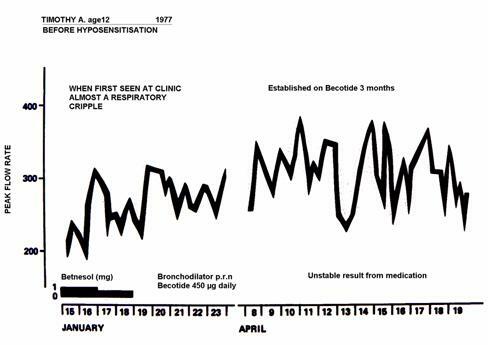 Bronchial provocation tests were carried out before and after, and if still positive further injections of the top dose given until the bronchial provocation test was negative. The patient would be discharged to receive booster or maintenance injections for some time in order to maintain the hard-won immunity. A few examples of the results obtained with these methods are included here as a matter of interest, and as a demonstration of how it was possible to practically cure patients of their asthma in this way. This patient was a very unstable mite allergic asthmatic who had to be stabilised in hospital with high dose oral steroids before desensitisation could be carried out using pure mite extracts. The contrast with before treatment is remarkable, this effect was long lasting, and he required very little treatment. This athletic patient had exercise provoked asthma so severe that his peak flow would drop to 100 just 12 minutes after exercise. Desensitisation abolished this response almost completely, as shown. This asthmatic response to a nasal provocation test with dust mite shows how the nose and bronchi react as one. Desensitisation abolished this reaction to some extent, but the delayed reaction two days later still occurred. The life of this chronic asthmatic mother was completely revolutionised by this therapy. She was able to swim and do physical exercise for the first time in 20 years, and enjoy playing with her children. She remained well thereafter in spite of the fact that her maintenance booster injections could not be continued because they became taboo for asthma. This lady was a very unstable asthmatic, as shown, and needed frequent courses of oral steroids. 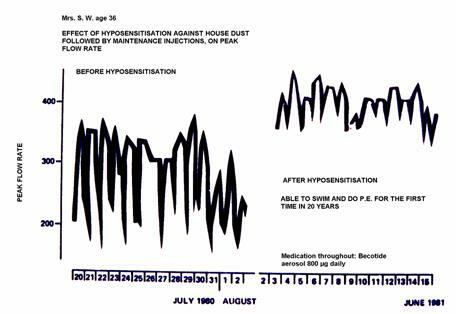 The difference after she was thoroughly desensitised to dust is remarkable, and she was maintained on only 400 micrograms of Becotide daily. 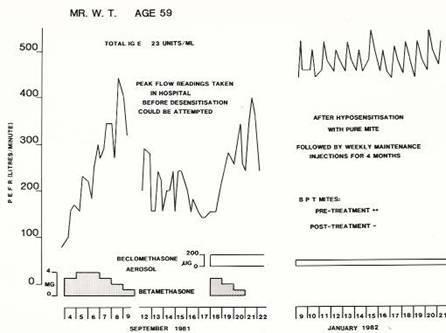 This is a very good example of a middle-aged patient who had very large fluctuations in the peak flow every day. With weekly maintenance injections there is a remarkable stabilisation of the peak flow and the fluctuations were no more than 50 to 100 at the most. There was no other change to her treatment. 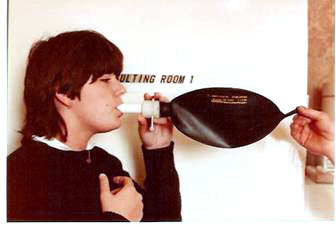 In 1968 62 asthmatics were intensively desensitised as out-patients by weekly injections of aqueous extracts of house dust. Of this group 30 ceased oral steroids, 32 were much better, and 21 failed to improve. Skin tests for dust became negative in 10, and for mites in 13. 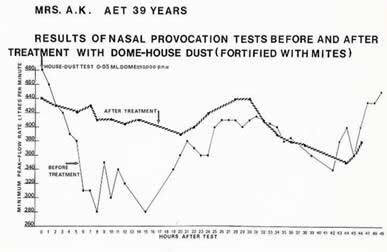 The nasal provocation test with house dust became negative in 52 cases, so other unknown allergens were probably part of the problem. 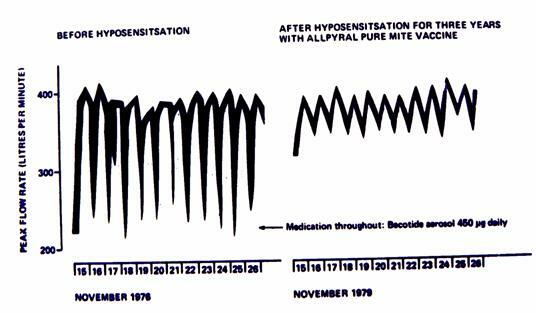 In 1978, when pure mite extracts had become available, 27 asthmatics were given three injections a day in hospital. 11 of then were able to stop oral steroids, 17 were much improved, 3 failed, and the case was complicated by multiple allergies in 8. Nasal provocation test became negative in 25, and skin test became negative in 10 cases. 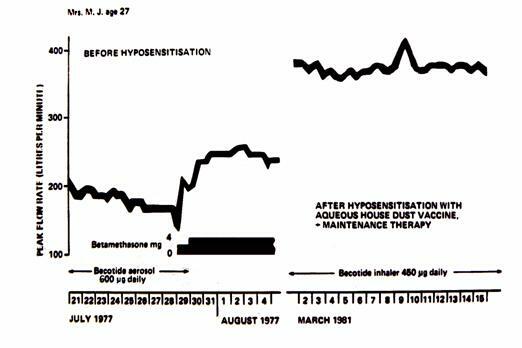 In 1979 41 asthmatics were treated in the same way with pure mite extracts, and 27 were much better, As 14 of the 16 children were much improved and only 13 out of 25 adults, it was clear that desensitisation is more helpful in the younger age group. 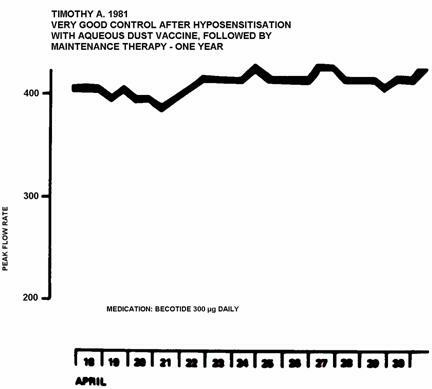 In the following years 78 asthmatics with proven allergies to yeast, wool, moulds, dog, and cat were treated with aqueous extracts in hospital and 57 were much improved. My development of the “Re-breathing Broncho-test”, which will trigger a mild asthmatic attack to confirm sensitivity to an allergen, or lack of reaction after desensitisation, enabled these researches to be carried out. Bronchial provocation tests usually have to be carried out in hospital because severe delayed reactions are common, but the rebreathing method avoids this problem and has only once in many thousands of tests caused a delayed reaction. As a result this test can be safely carried out as an outpatient. The aerosol of allergen extract is made into the 2 litre anaesthetic bag. The patient breathes in and out from the bag five times. They cannot inhale more than the dose in the bag, unlike the usual method where extract is inhaled until a reaction occurs. Peak flow is checked every five minutes, and the reaction will subside by 20 minutes. It seems to me that the future of specific treatment for allergies may lie under the tongue because this is the area of the alimentary tract which is the first to encounter all ingested foreign proteins in food, and to which IgG type antibodies are normally developed. Perhaps the sublingual area should be regarded as the gateway to the immune system. The fact that the administration of SLIT every day at home would be unsupervised will cause grave misgivings to many doctors, but could be overcome by a positive programme of instruction and careful follow-up, which could be best carried out by our growing army of nurse specialists. Perhaps we should reassess the work of early pioneers such as Dr Schofield almost a century ago with his egg pills which enabled one dangerously allergic little boy to tolerate eggs. 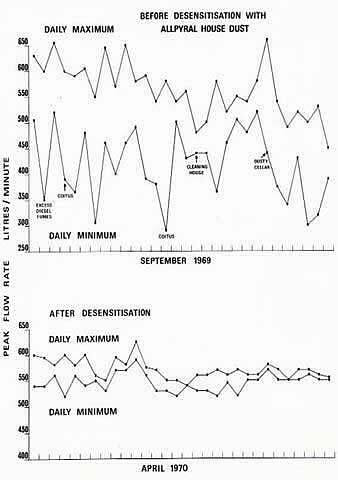 I will always remember that Professor John W Gerrard, a Canadian paediatrician and allergist, successfully tried a very similar method with peanut allergy, but when this work was presented at a meeting in New York at which I was present in 1985 his colleagues were horrified at the potential risks. Nobody seemed interested to try this method, and much was made of potential dangers, but subsequent attempts in the USA to treat peanut allergy by the injection method encountered very serious reactions. The key to these dangerous allergy problems could be to stimulate adaptation to these allergens by starting with an almost ‘homeopathic’ dose sub-lingually and increasing it very gradually to avoid any danger of reaction. The level of sensitivity would be established with great care before commencing treatment, or the dosage started at a very low level indeed. Any temptation to hurry this process would risk increasing the dose faster than the patient was becoming desensitised, or adapted, to the allergen, so disaster could happen. However, in the present medical climate of defensive medicine and increasing regulation it would be a brave or foolhardy investigator who would embark on such an enterprise, and most unlikely that any ethical committee, who would almost certainly be know very little about allergy, could be persuaded to allow such a trial to take place. It seems most unlikely that any research into desensitisation against dangerous food allergies will be carried out in the foreseeable future. "It is a paradox that while Britain has the highest incidence of allergic disease in the world, it also has the most inadequate allergy service"